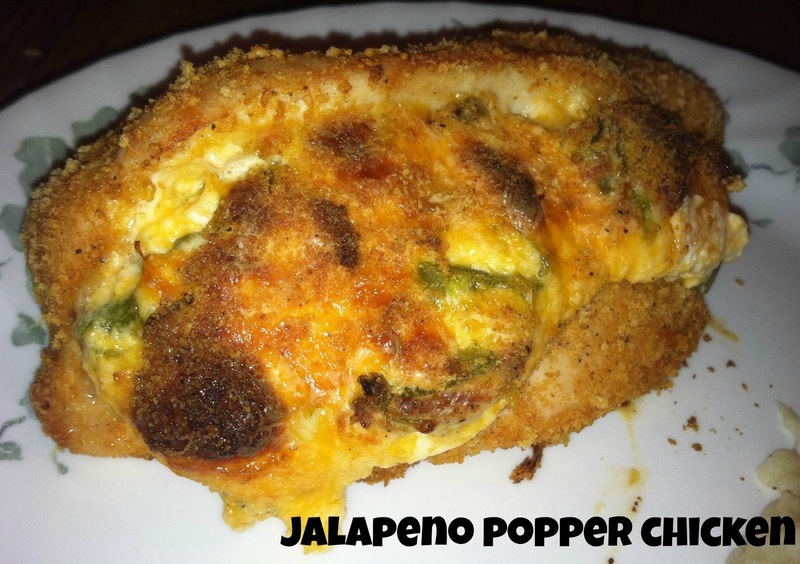 Jalapeno poppers are pretty much one of the greatest fried little morsels of deliciousness. Ever. And the other day while grocery shopping I was determined to do only "perimeter shopping". Lots of fruits, veggies, you know - all the fresh stuff. Well some jalapenos were staring me in the eye and I picked some up. I didn't know what exactly I was going to use them for at the time. 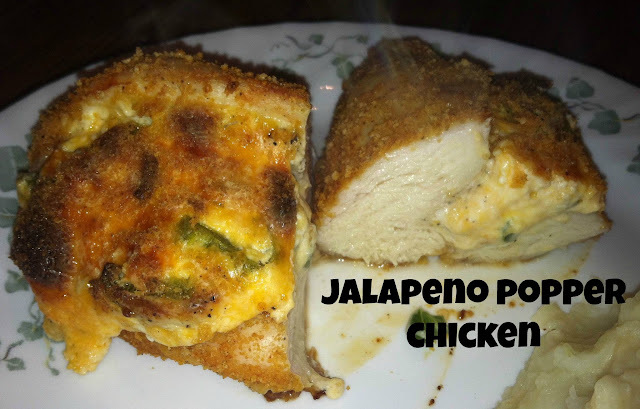 Making jalapeno poppers did cross my mind, however I didn't pick up enough to make it "worth while" (you know, I need to make at least 20 for my husband and I)...so I decided to try making a jalapeno popper chicken breast! Not to toot my horn, but they came out rather tasty. Toot Toot! I didn't know what to use to make a great crunchy coating to replicate the fried goodness of the poppers, but after searching through my cupboards I found a new box of Shake & Bake (oh yeah) and it actually ended up working perfect! (and yes, I kept telling myself "it's Shake & Bake, and I helped" while preparing dinner). It was just a basic, no extra flavors added Shake & Bake, but panko bread crumbs, or crushed Wheaties or Cornflakes would work out just fine as well. Trim fat off of each chicken breast, and cut a slit in each one to create a pocket. Pour the Shake & Bake coating into a shallow bowl or plate. Cut the stem off of the jalapenos, slice open and remove as many of the seeds as you would like. Combine the cream cheese, cheddar cheese, and chopped jalapenos in a bowl. Form the cream cheese mixture into little "logs" that will fit into the pocket of each chicken breast. Sprinkle a little salt and pepper into the pocket of each breast, and put one cream cheese "log" into each breast. Press the chicken breast into the Shake & Bake on both sides to cover the chicken and then place in the baking dish. Depending on how big your chicken breasts are, adjust cooking time accordingly. I had some pretty hefty chickens!